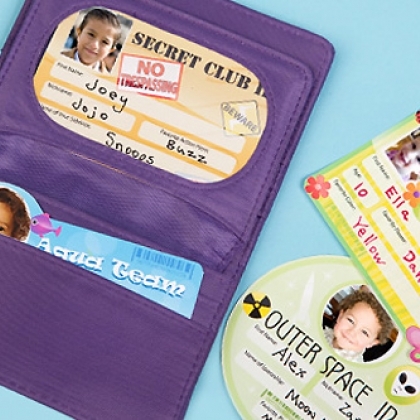 Do your kids what to be members of a secret club? Have special crime-fighting skills? With a little imagination and a laminator you can make this happen. Creating fantasy ID badges lets kids imagination soar. And it’s easy. Print the document on index cards. Laminate to create awesome ID cards they can keep in a wallet. For a birthday party, collect photos of all the kids invited and laminate special VIP Members ID Cards to get into the party. Kids can flash their B-day ID at school so everybody knows they were there!